1) Basic physics – human fossil fuel combustion has increased the greenhouse effect, causing a global energy imbalance, which the planet responds to by warming. Over the past several centuries, human greenhouse gas emissions have caused by far the largest radiative forcing (energy imbalance), and thus must be the driver of any observed long-term global warming. 2) Human fingerprints – there are a number of climate changes we expect to see in response to an increased greenhouse effect. We have indeed observed these changes, which are ‘fingerprints’ of human-caused global warming. 3) Attribution studies – many studies have been performed to try and determine the causes of the observed global warming, and every such study has been consistent in concluding that humans are the driving force. For starters, a long-term increase in the average global temperature must be caused by a global energy imbalance – an external radiative forcing. We have observed an increased greenhouse effect with more radiation reaching the surface and less leaving the atmosphere. Scientists have quantified the energy imbalance caused by this increased greenhouse effect, and the radiative forcings associated with various other effects like increasing solar radiation. Overall, they find that by far the largest radiative forcing over the past 250 years comes from the increased greenhouse effect, which we also know is due to human fossil fuel combustion (Figure 3). Figure 3: Global average radiative forcing in 2005 (best estimates and 5 to 95% uncertainty ranges) with respect to 1750 (IPCC AR4). It’s just fundamental physics that this large radiative forcing must result in global warming until the Earth reaches a new energy equilibrium at a higher temperature. For ‘skeptics’ to make a convincing argument that humans are not causing global warming, they must both explain where this large greenhouse gas radiative forcing has gone, and find an even larger ‘natural’ radiative forcing which nobody has yet identified. 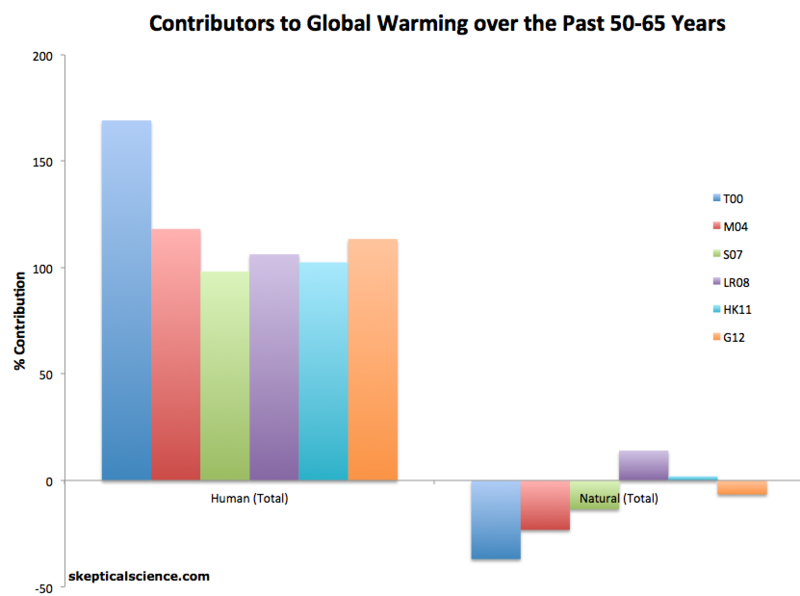 Until the ‘skeptics’ can explain this, the evidence clearly indicates that humans are driving global warming. There are also a number of ‘fingerprints’ which are either indicative of or consistent with what we expect from global warming caused by an increased greenhouse effect. For example, we expect to see the lower atmosphere warm and the upper atmosphere cool, because greenhouse gases are primarily located in the lower atmosphere, and effectively trap heat there. More radiation is directed back towards the surface, less makes it up into the upper atmosphere. There are many other examples of human global warming ‘fingerprints’ (Figure 4). 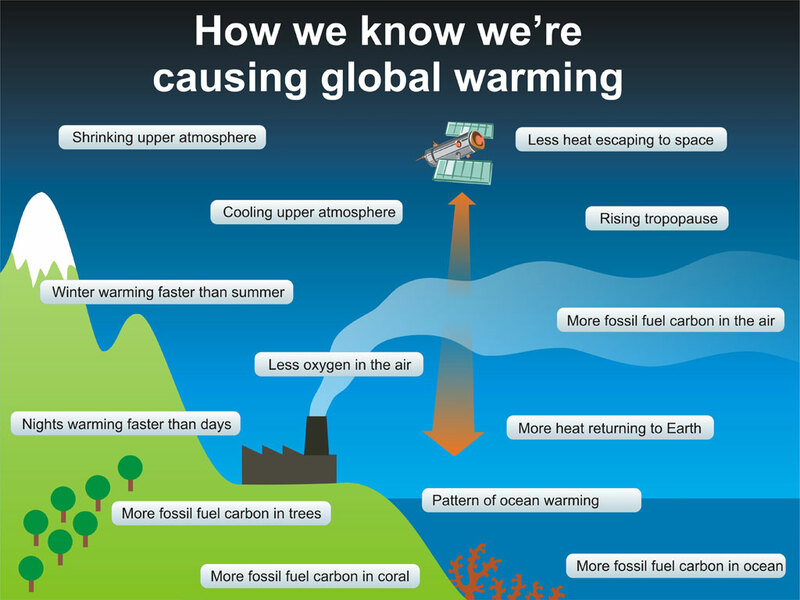 As we have previously discussed, there have been a great many studies using various different approaches to determine the causes of the observed global warming. Every such attribution study has been consistent in concluding that humans are driving global warming (Figure 5), with greenhouse gases causing more than 100% of the observed warming because much of that is offset by the cooling effects of human aerosol emissions, which block sunlight (Figure 6). Figure 5: Net human and natural percent contributions to the observed global surface warming over the past 50-65 years according to Tett et al. 2000 (T00, dark blue), Meehl et al. 2004 (M04, red), Stone et al. 2007 (S07, green), Lean and Rind 2008 (LR08, purple), Huber and Knutti 2011 (HK11, light blue), and Gillett et al. 2012 (G12, orange). 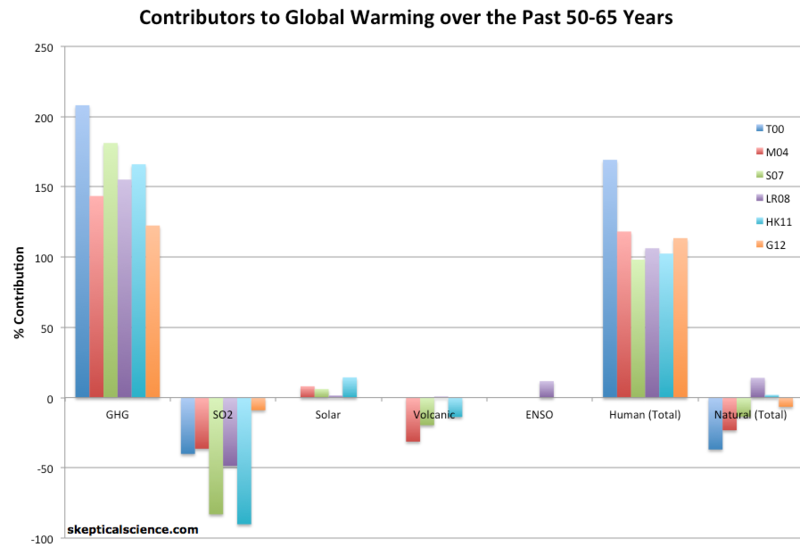 Figure 6: Percent contributions of various effects to the observed global surface warming over the past 50-65 years according to Tett et al. 2000 (T00, dark blue), Meehl et al. 2004(M04, red), Stone et al. 2007 (S07, green), Lean and Rind 2008 (LR08, purple), Huber and Knutti 2011 (HK11, light blue), and Gillett et al. 2012 (G12, orange). All of these studies find that humans are responsible for close to 100% of the observed global warming over the past 50 years, and human greenhouse gas emissions are responsible for close to 150% of the observed warming, with human aerosol (sulfur dioxide – SO2) emissions offsetting approximately one-third to one-half of that greenhouse warming. “Likely” corresponds to greater than 66% probability. In the 2007 IPCC Fourth Assessment Report, confidence in this statement grew even stronger to “very likely“, which corresponds to greater than 90% probability. On top of these many lines of evidence which mostly focused on global warming at the surface, Gleckler et al. (2012) also confirmed that the warming of the oceans has been caused by humans. While it’s nice that Muller and the BEST team have confirmed human-caused global warming to their own satisfaction, it is not a new result by any stretch of the imagination, and there have been a number of studies with far more robust methodology arriving at the same conclusion. The BEST team also found that the observed warming is consistent with an equilibrium climate sensitivity of 3.1 ± 0.3°C for CO2 doubling, in line with the IPCC climate sensitivity range, and demonstrates once again that contrary to the persistent claims of Richard Lindzen, the Earth has warmed as much as we expect given a relatively high climate sensitivity. The bottom line is that humans are the driving force behind the current global warming. This entry was posted on Thursday, August 9th, 2012 at 7:00 am. It is filed under Uncategorized and tagged with climate change. You can follow any responses to this entry through the RSS 2.0 feed.